There was a time before penicillin and polio shots, Xerox and Xbox, contact lenses and credit cards. A time when there was no such thing as FM radios, cell phones, MP3's or CDs. Those days, kids walked to school-rain or shine-because there was no bus. On a summer day, they left the house to go outside to play at 8:00 a.m. and returned for dinner at the call of a whistle. No one ever asked where the car keys were because they were always in the glove box or ignition, and the doors were never locked. Gas was 28 cents a gallon! 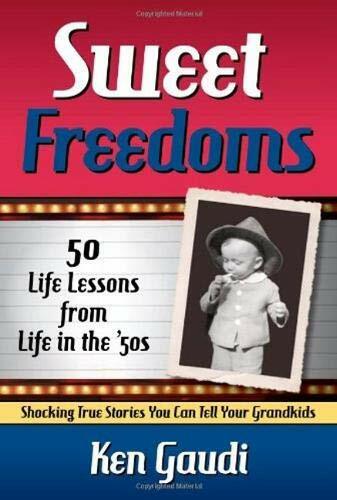 Ken Gaudi will have you laughing and crying (or just maybe pondering) as you read Sweet Freedoms-a memoir dedicated to his grandchildren. Learn from the past as you read 50 unbelievable adventure stories intertwined with savvy life lessons based on childhood experiences of life in the '50s.